This is not a Photo Shop! 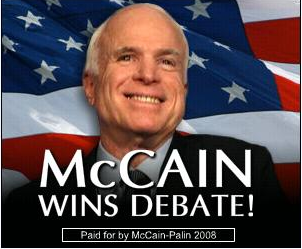 Despite the fact that according to McCain the whole thing is over already, the BIG DEBATE is on tonight. Let’s all get housed and root for our favorite team…er… I mean potential next leader of the free world. Prev 191 & Bathgate: the MOVIE!